Ok, this is the funniest error message I ever saw. 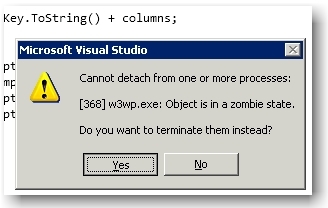 I have VS 2010 up and debugging an application. I also had a .NET 2.0 site running that I shut down. There were two worker processes running on my machine. I killed various apps such as IE but they all still showed up in the task bar. So I thought, the darn worker process must be freezing up my machine. I killed it and got the strange Zombie Message below.